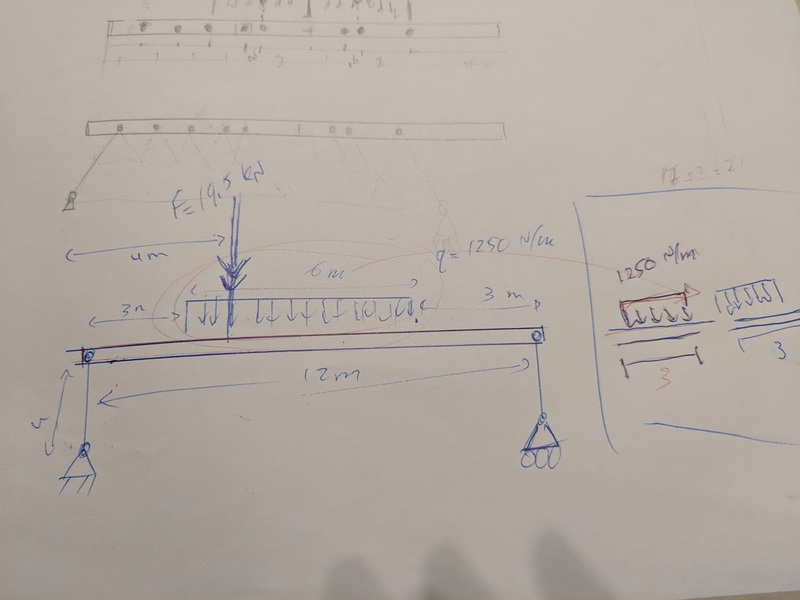 My problem is a bridge with a horizontal cord of span 12 m between two piers of arbitrary height. It is required to use a pin-connected truss, consisting of steel members bolted together to steel gusset plates. Assume the end supports at the piers to be a pin and a roller. A vertical loading of a concentrated force $F$ [19.5 kN] acting 4 m from the left-hand support, and linearly distributed load $q$ [1250 N/m] acting on the central 6 m of the span. This load can be applied in part to several joints on the top cord within the given region. The force of the wind and the weight of all members are to be neglected. Assume the maximum tensile force in each member cannot exceed 4.25 kN, and the maximum compressive force cannot exceed 3.5 kN regardless of the length of the member. I knew that I can reduce the concentrated force by adding a pin on that force and join the pin to multiple members, but doing that leaves me with too much unknowns. 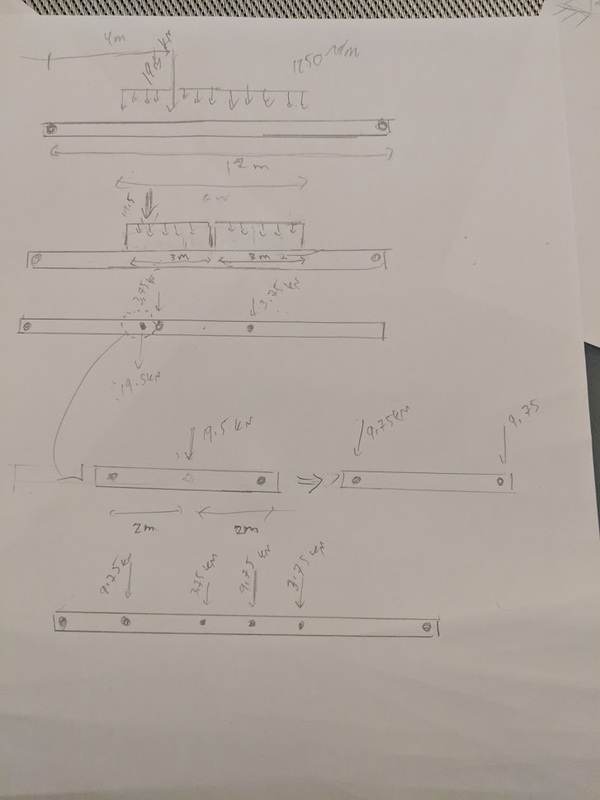 There is no restriction about how the bridge should look like, but I designed mine so to have in each member tension not more then 4.25KN and compression less than 3.5 KN. Browse other questions tagged structural-engineering or ask your own question. Is it acceptable, with reinforcement, to notch a floor joist more than 1/6 of the depth? How is prestressing with losses self-balanced? What is the unbraced length of the compression portion of an X brace? Does an external force at a joint between two members act on one member or on both? Why would a bearing plate that further concentrates load onto small surface be used? Why does a simple pin-ended triangular (arched/curved) beam deflect more due to secondary effects (non-linear analysis)? 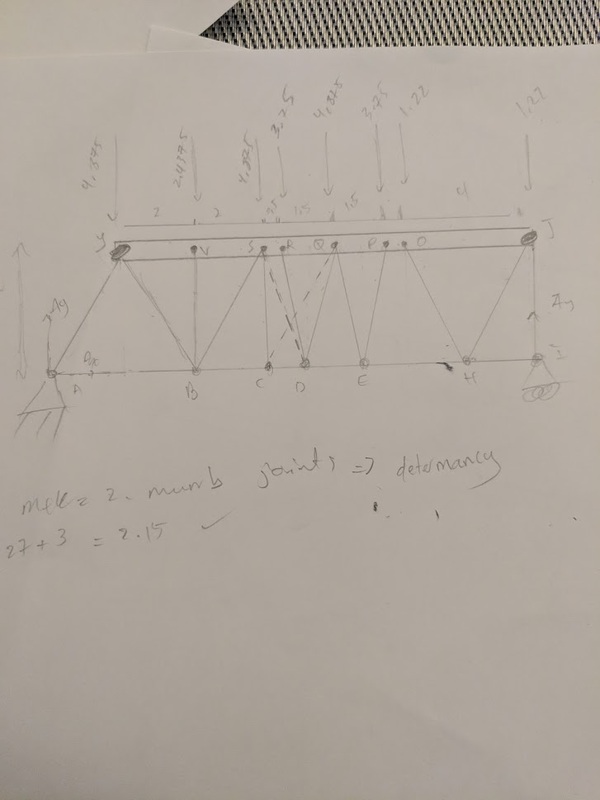 Member weight in a planar truss?